When I was little I loved those rare books that were broken into horizontal sections so that you could mix and match different pictures. My library had one featuring a picture of a little girl that needed dressing for various occasions and seasons. I loved putting her in crazy combinations such as snow boots and a tutu. My love of these kind of books extended into my thirties when I happened across the endearingly old-fashioned First Slice Your Cookbook by Arabella Boxer. Apparently every cook’s ‘must-have’ book in the seventies, First Slice is ‘sliced’ into soups, main courses and desserts so that you can plan the perfect menu. 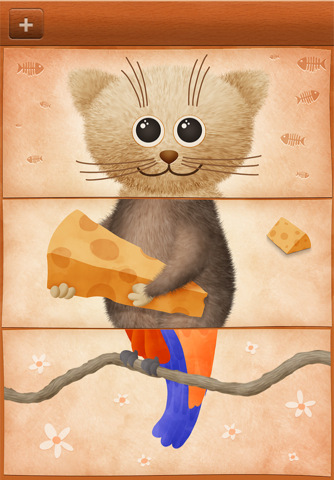 When I came across the sweet little iPhone and iPad app, Mousefish, aimed at the littlest iPhone users, I was instantly reminded of flip books. Using the same principal as flip books, Mousefish has sections of a number of animals that you can splice together. Part mouse, part fish and part caterpillar. Or part parrot, part mouse and part octopus. Mix up the heads, bodies and legs (or tails) and come up with some weird and wonderful new creatures. Created by Jake MacMullin, the animals are finely drawn with appealing little details such as floral and jellyfish wallpapers, cheeky smiles and clutching their food of choice. Mousefish is very simple and is great for young pre-schoolers. It’s free and available to download via iTunes. Check out other apps that we have reviewed here.